Jimmi's challenge for Unity's Anniversary Week was to make a card using the very first Unity stamps you bought. So I had to use Gratitude=Joy, and this turned out to be my favorite card of all the challenge cards I made. It's my fave too...that's why it's in my favorites! I just gotta case this one...it's totally perfect! sooo wonderfully clean & crisp Becky! This is a stunning card. I was speachless when I saw it. Beautiful job on this card! I love that leaf image stamped on the background! Wonderful color combination, Becky! Great card! Love the clean LO and fun colors! Awesome card, Becky! 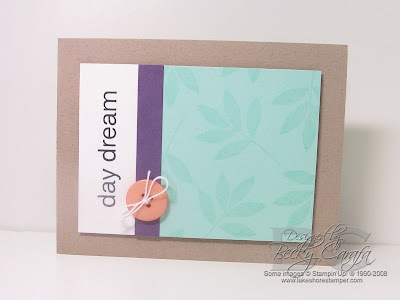 I love the pretty color combo and the simplicity of the card. It has a nice professional look to it!! Oooh, this is clean and simple fabulousness! !